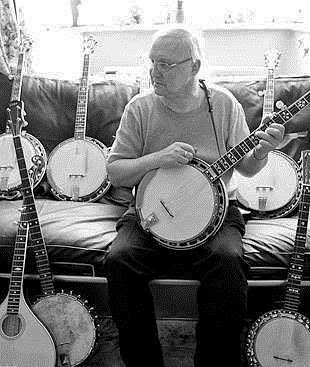 As previously reported in the EBMA blog, Phill Morley - cornerstone of British Bluegrass – passed away at the end of August. I was very saddened to hear of the passing of Phill Morley. He was a delightful guy, friendly and knowledgeable, and always looking to be helpful. I first got acquainted with him at the very first SFW (1996), when I was the banjo tutor and had 37 of the 57 students enrolled that year (!). Phill was called in to help me out and … did an excellent job working in tandem with me. We stayed in touch sporadically after that, and he would send me the newsletter he provided his students. Just that helpful act, sending out an informative newsletter to students, shows his "teacher's heart" as I like to call it. The British Bluegrass scene has lost a special guy, who I'm sure will be long- and well-remembered. As well as being known as a teacher, Phill was instrumental in establishing and running the East Anglian Bluegrass Festival at Steeple Morden in Hertfordshire, England. Phill’s favourite band was Special Consensus and Phill’s family and friends have decided to hold a memorial concert featuring Special Consensus. Full details of the memorial concert can be found on the East Anglian Bluegrasswebsite but, in summary, the concert will be held in Bassingbourn Village College in Bassingbourn, near Royston in Hertfordshire. Special Consensus will play two sets (starting at 5pm) with the Memorial Concert concluding with a Bluegrass Jam led by Greg Cahill of Special Consensus. Tickets can be purchased via the East Anglian Bluegrass website (early booking is strongly advised). Special Consensus’ album “Scratch Gravel Road” (released in 2012) was nominated for the Best Bluegrass Album GRAMMY Award and the song “Monroe’s Doctrine” from that recording was nominated for the IBMA Recorded Event of the Year award in 2012. Their album “Country Boy: A Bluegrass Tribute To John Denver” was released in March, 2014. Two songs from ‘Country Boy’ received IBMA awards in 2014: “Thank God I’m A Country Boy” received the Instrumental Recorded Performance of the Year Award and “Wild Montana Skies” received the Recorded Event of the Year Award. EWOB 2015: Only two weeks remaining to apply!